If you’re out and about and want to grab something to eat, a sandwich shop can seem like the obvious choice. But if you’re concerned about your health, you need to look out for some of the sandwich bar pitfalls, because what seems like an innocent sandwich could be loaded with hidden fat and calories. What Are the Healthiest Fast Food Options In A Sandwich Bar? The healthiest options are usually the simplest. The sandwich: There are usually several healthy options when it comes to the sandwich itself. Many shops sell speciality breads which in themselves are fine, although if you’re watching calories you’d do well to avoid the cheese topped rolls in favour of a whole grain or wholemeal option instead. Brown bread has more nutrients than white, so again, although there’s nothing intrinsically unhealthy about eating white bread, for optimum nutrition you could go for a malted wholegrain roll or sandwich instead. The sandwich fillings are where most fast food shops tend to lose the plot. In a nut shell, if you head for the healthy salad first to bulk up your sandwich, and then add some protein – either in the form of a little egg, or some cheese (low fat if they have it, or a little grated cheddar) or perhaps some lean meat (chicken, turkey, roast beef slices, or plain tuna) and skip the mayonnaise laden mixes, you should be able to manage a healthy sandwich lunch. Fast food doesn’t have to be unhealthy by any means. Pass on the butter or margarine, don’t add any mayonnaise, and bulk the sandwich out with vegetables and salad to get the best healthy meal you can. Most sandwich bars have a variety of other food as well as the humble sandwich to choose from If you choose wisely you can have a healthy snack that will keep you going on the move. The Salad Bar Choose wisely when in the salad bar – as well as the virtuous choices of vegetables, there are often mayonnaise covered concoctions that barely resemble anything you’d describe as healthy eating. Give the dressings a miss and stick to vegetables with a low fat protein option such as chicken, fish, egg. Or you could push the boat out and have hummus which although it can be high fat, it’s not the bad, saturated fat, but comes from olive oil. Jacket Potatoes A potato can be a good choice on a cold day, if you want something to sustain you. Leave the butter off, and opt for fillings that aren’t smothered in mayonnaise. Baked beans, plain tuna and sweet corn are good options. Go easy on the cheese, and watch out for hidden fats in fillings such as chilli and curry, or tuna and chicken mixes with mayonnaise. Little Extras Leave the snack eggs, pork pies and sausage rolls where they are and you can fill up on a delicious, nutritious salad instead. Crisps and chocolates are there to tempt you into eating them, but contain very little other than fat and sugar, so aren’t a great choice if you’re trying to look out for your health. The Fruit Bowl If you fancy a little extra, select from the fruit bowl, rather than going for one of the cakes and pastries that will undoubtedly be on offer. A banana will give you a great source of carbohydrate, and is also good for keeping you going in the afternoon if you feel a bit peckish. Apples and oranges are great for vitamins and fibre, and often you’ll also find packets of dried fruit and nuts which are good to snack on during the mid afternoon lull in proceedings too. 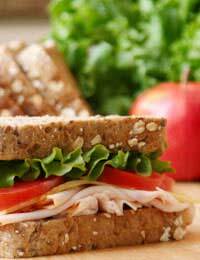 It’s easy to pick a healthy lunch from the sandwich shop if you know what you’re looking for!